Your domain extension is the part of your domain that comes after the final dot. For example, ours is .com. 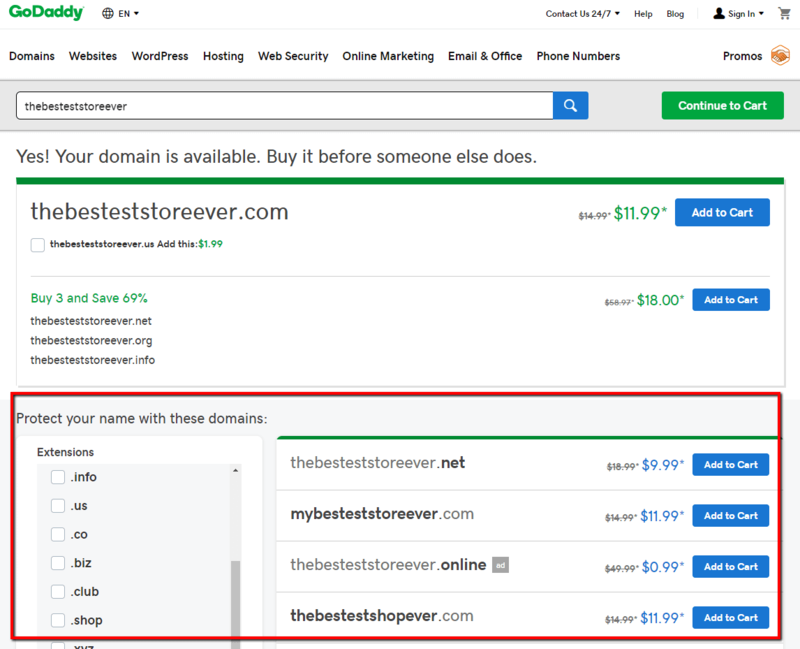 And while .com is the most well-known option, you actually have a ton of options when it comes to domain extensions, which is why you might be looking for some help making your choice. In 1985, only nine domain extensions existed. Up until the 90s, about nine or ten domain extensions were added each year. After that, it was off to the races. At the time this article is being written, you can choose from over 1,000 domain extensions (you can see the entire list on the IANA (Internet Assigned Numbers Authority) website). The strange thing is that you probably only know a handful of them: .com, .gov, .net, .org, .edu, then maybe some country domain extensions like .us. But that raises the question, what’s the point of all of these domain extensions and are there advantages for the average business, blogger, or developer? Help with branding for an individual company or an entire industry – Like .aarp or .realtor. Indicate that a website is located in a certain country. 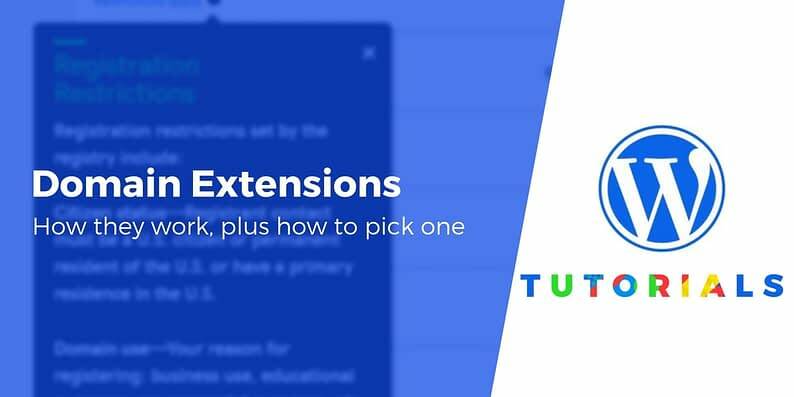 This is useful for companies that only serve those countries and to break up the Internet into languages and currencies – Think .cz for the Czech Republic or .de for Germany. Serve a specific community, based on geographic location, ethnic, technical, or other categories. The .asia domain extension is a good example, since it focuses more on a regional community as opposed to one country. Restrict usage of the top-level domain for people or organizations in a certain group. Take .edu, for example. You’re only able to use that domain extension if you run an accredited educational institution. The same can be said for many country or regional domains, where you must be a citizen of, or have a business in, the country. So, which domain extensions can you use for your website? That depends on what type of organization you’re running and which domain name extension you’re looking at. Restricted – you need to meet certain criteria to purchase one of these domain name extensions. Many of them have been paid for (sponsored) by an organization or set aside for certain groups. 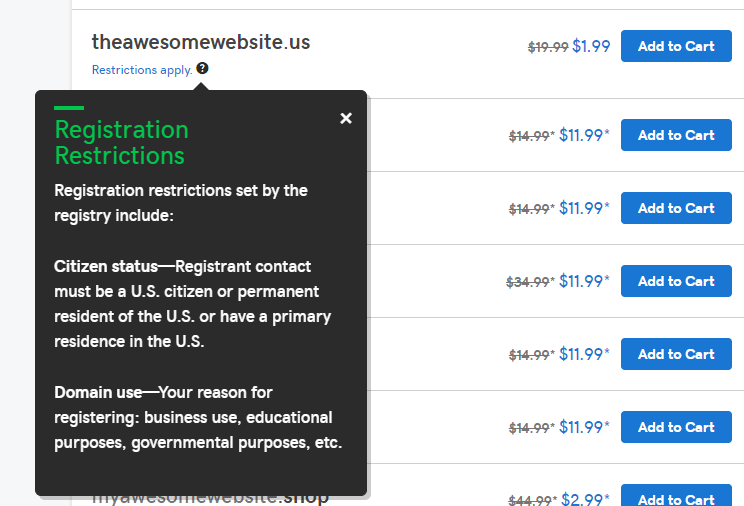 Unrestricted – anyone can purchase a domain name with one of these extensions. One of the only types of restricted domains sold through sites like GoDaddy is a country domain extension. So, .us can be bought directly online, but you must prove that you’re a permanent resident of the United States. As for most restricted top-level domains, you typically need to be part of an organization, industry, region, or another type of group to get the domain extension. In addition, you’re required to contact the top-level domain owner and walk through their unique vetting and purchasing process. A great example is the .aero domain extension. This top-level domain was paid for, and is now sponsored by, an organization called Societe Internationale de Telecommunications Aeronautique (SITA). This sponsor has rules on its top-level domain, saying that in order to use it your company must be in the air transportation industry. 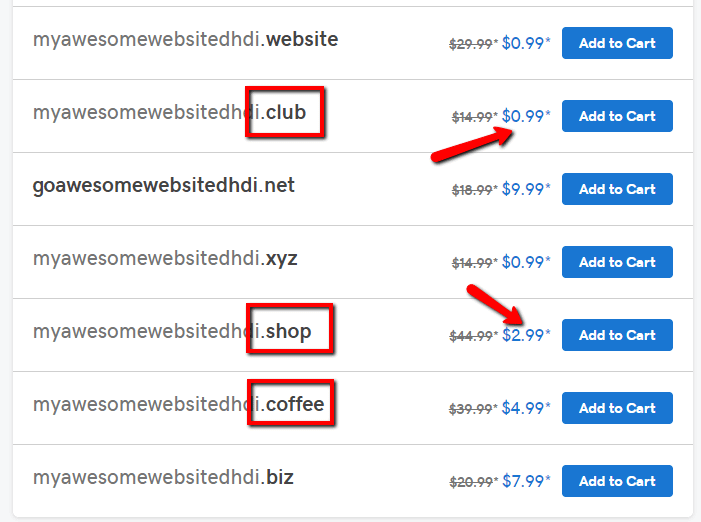 There’s a good deal of variation in the price of different domain name extensions. For unrestricted domains, the pricing is usually very inexpensive. 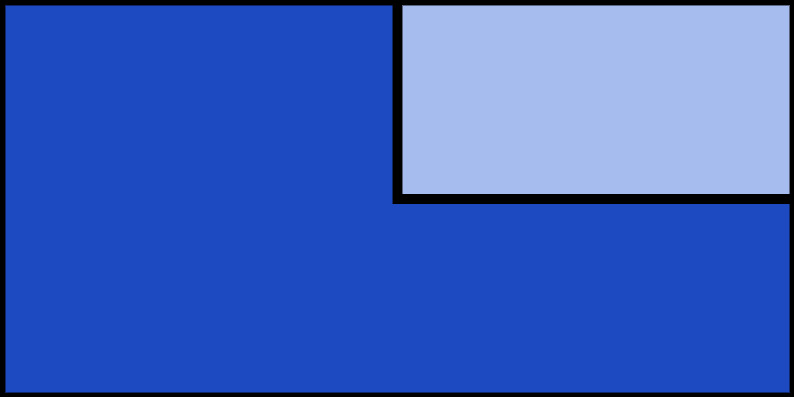 Standard domains with extensions like .com usually cost around $10 per year. If you’re planning on buying a restricted domain, you may have to pay a premium, though. However, this all depends on the owner of that top-level domain and each top-level domain extension has a different price. Which of these domain extensions should you go with? To start the process, consider what type of business or organization you’re trying to represent online. 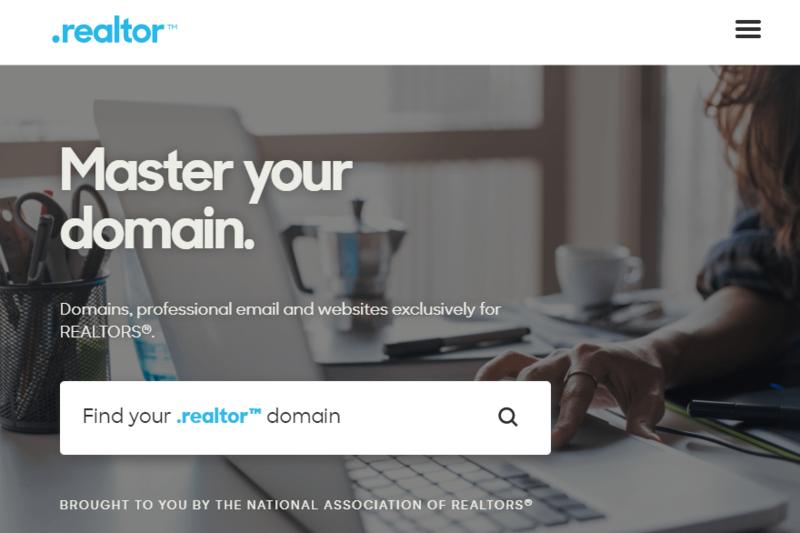 If it’s in a certain industry, you might be able to apply for a restricted domain extension–like a real estate agent applying for the .realtor extension. If you’re only conducting business in a certain country, you might want to stand out with a country-based extension like .us. Beyond branding, you can also use a country-specific domain name to indicate to Google that your site targets that region (explanation here). If you’re targeting people around the world, your best bet is unrestricted domain extension, though. There’s nothing wrong with these, as long as you’re not choosing .net because another company has the same domain as you. That’s a branding nightmare if there are two websites with nothing different but a domain extension. Other than that, you can go with a .com or .net domain extension if it’s available. The .coms of the world are easy to remember as long as whatever you put in front of the .com is short and to the point. This is where you can really specify what it is you do. An online store might enjoy the .store option, while a country club could go with .club to show some exclusivity in the domain name. Delicious, the pinboard blog, has one of the most unique domain names out there. It utilized the .us domain extension and made its domain name del.icio.us. Some other examples are great for branding, such as Last.fm (music streaming) and thegreen.diet (a domain stating, literally, what the site sells). So, I encourage you to think creatively when making your domain and don’t forget about some of those domain extensions that make for branding dreams! And if you need help, you can always use a blog name generator, or check out some other tips for choosing a domain name. That wraps up our post! If you have any questions about how or why you might choose a top-level domain, let us know in the comments below.